(Newser) – Scottish police say eight people are now confirmed dead following the crash of a police helicopter into a crowded Glasgow pub last night. 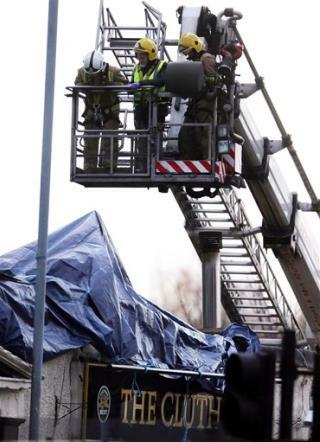 Chief Constable Stephen House says all those aboard the helicopter—two officers and a civilian pilot—died when the aircraft crashed into the roof of The Clutha pub and five other people were killed on the ground. He said today that 14 injured people remain in Glasgow hospitals following the crash. what was the song? The roof, the roof, the roof is on Fire? When we make innocent choices but something horrible happens anyway, I am tempted to believe in such a thing as "fate." However, "fate" is a thing and not a caring person. Therefore, I know and observe that most of the things that happen to us--good and bad--are the results of the choices we make. I do not say it was wrong for the people to be there, but I wonder if at least some of them could have had any warning what was going to happen. Here's a quote I've had on my refrigerator for awhile: "God didn't promise days without pain, laughter without sorrow, sun without rain, but He did promise strength for the day, comfort for the tears, and light for the way." The band kept playing after the roof started buckling? I guess those numbnuts never heard of Great White or the Station Fire.